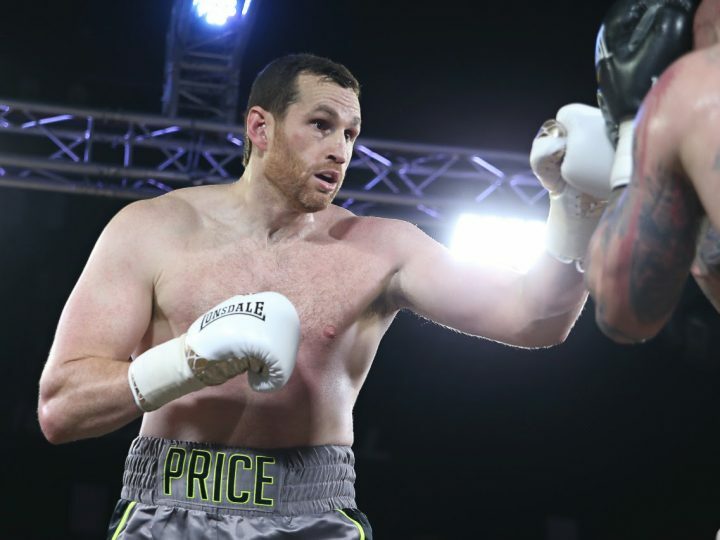 By Scott Gilfoid: David Price will be fighting next month on December 22 on the Dillian Whyte vs. Dereck Chisora 2 card, possibly against former heavyweight world title challenger Carlos Takam. Matchroom promoter Eddie Hearn is working on adding the 35-year-old Price (22-6, 18 KOs) to the Whyte-Chisora 2 card on Sky Box Office PPV at the O2 Arena in London, England. At this point, you can’t expect much from Price. If Hearn would put him in with guys at his class like Sam Sexton, it wouldn’t be such a problem. But he keeps getting matched against fighters that are simply too good for him. Takam is clearly way too talented Price, and it’ll be bad for him if that fight does take place. Some boxing fans would argue that if Hearn is going to put Takam on his his December 22 card, he should at least put him in with a quality fighter rather than sticking him in with journeyman Price. Takam deserves better than Price as his opponent. Dillian Whyte would be a good option for Takam if he wasn’t already scheduled to face Chisora again. Price will be on the Whyte-Chisora2 card whether he faces Takem (35-5-1, 27 KOs) next or not. Price and Takam have both lost their last two fights by knockout, and they’re looking shot to pieces. It’s not a good fight for either guy. Price will likely be knocked out badly once again and see his career effectively finished off. Likewise, it’s a terrible fight for Takam, considering he won’t be facing a top tier fighter. Going from fighting a fringe level heavyweight in Chisora to facing a domestic level guy in 6’7″ Price is a big step down for Takam. Hearn needs to add recognizable names to the Whyte vs. Chisora2 card, because it’s going to be on Sky Box Office, and right now the undercard is competely barren of talent. The only fight on the card right now is the main event, and even that match isn’t one that the British boxing public is all that excited about due to it being another one of Hearn’s retread fights that he likes to do. The fans wanted to see Whyte matched against Luis ‘King Kong’ Ortiz, but Hearn wasn’t keen on making that fight for some reason. You can kind of guess why. Hearn want to make sure that Whyte wins his December 22 fight o that he can use him as a puzzle piece to stick in with Anthony Joshua on April 13 at Wembley Stadium in London, England. If Whyte were to lose to Ortiz, there would be tremendous pressure put on Hearn to match Joshua against WBC heavyweight champion Deontay Wilder, and he simply has no interested in making that fight by all accounts. Hearn wants to match Joshua against his Matchroom stable fighter one after another. As a last minute replacement opponent, Takam, 37, gave Joshua all he could handle last year in losing to IBF/WBA/WBO heavyweight champion Anthony Joshua (22-0, 21 KOs) by a controversial 10th round knockout on October 28 in Cardiff, Wales. The referee Phil Edwards jumped in and suddenly stopped the fight in the 10th round in the middle of an exchange between the two fighters. It was the oddest thing. The boxing fans at the Principality Stadium booed the strange stoppage loudly, as Takam didn’t look hurt and was still fighting. It looked to some like the referee made up his mind he was going to stop the fight, and he went ahead without rhyme or reason. Although Takam was given a loss on his record, you can argue that it was more of a no contest type of fight due to the oddball stoppage by the referee. In Takam’s last fight against Chisora, he was hurt with a looping right hand rabbit punch that hurt him and put him down. The referee should have given Takam a timeout to recover from the shot to the back of the head, but instead he let the fight continue. Chisora knocked Takam down a second time, and the fight was then stopped. Both fights took place in the UK. Price still can punch with major power with both hands, but his stamina is so poor that he tends to gas out after two or three rounds. Price’s punch resistance is also incredibly poor as well. What this means is that if Price doesn’t KO Takam in the 1st round on December 22, then he’ll likely be knocked out quickly. The big question is why does Price keep getting all these chances given to him by Hearn for important fights. We’ve seen Price matched against Alexander Povetkin, Sergey Kuzmin and Christian Hammer. In each case, Price was knocked out and looked poor. Price had his moments early on against Hammer in knocking the German based heavyweight down in the 5th. But when Price couldn’t score a knockout, he ended up getting knocked out two rounds later in the 7th. Hearn continues to not give up on Price, and it just makes you wonder why he hasn’t cut his losses and moved on. We’re seeing the same thing with Hearn keeping David Allen around despite him being exposed by Luis Ortiz, Tony Yoka, Lenroy Thomas and Dillian Whyte. Hearn talks about how Allen is improving, but the reality is, he only looks good when he’s matched against worse fighters than himself. There are some guys out there that Price can beat, but unfortunately they’re not world class guys. In Price’s last fight, he was stopped in the 4th round by Sergey Kuzmin last September. Kuzmin is a decent heavyweight, but not a real talent. He’s not someone that is going anywhere career-wise. Knowing Hearn, this won’t be the last chance for Price on December 22. Price being a 2008 Olympian, and having a recognizable name that most British casual boxing fans can recognize, Hearn will likely keep him around for as long as possible for his under cards. It would be nice if Price ever did pull off an upset in one of the fights Hearn puts together, but it’s so unlikely to ever happen.Price’s days of pulling off upsets are long over. He’s now someone that can’t be counted on to beat any of the fringe level fighters in the heavyweight division, and of course he’s not capable of beating the talented fighters in the upper level of the division.